In a world filled with emails and text messages is it possible to motivate students to write friendly letters? Letter writing may seem like a dying art but you may be able to plant a seed in your students to keep it alive. Find out how to teach writing a friendly letter to third grade students in the article below. Did Aunt Mildred or Grandma send you a present for your birthday? Writing them a friendly letter to thank them is the right thing to do. Is your dad, uncle, cousin or neighbor serving in the military far away from home? A letter from you could really cheer them up. A few days before you do this lesson, if budget allows, write each student a short friendly letter and send it to his/her home. Use the appropriate format and mention some positive things about how the student is doing in school. To begin the lesson, discuss how getting the personal letters made them feel. Chances are it was exciting for the students to get a letter addressed to them. Remind them that this feeling is the same for everyone when they get a letter from a friend or loved one. Leave about an inch space or border all the way around the letter making it easier to read. This gives the address of the writer and the date that the letter was written. It is placed in the right hand corner about an inch from the top. The heading consists of three lines. The first line is the writer’s street address. The second line contains the city, state and zip code. The third line is the date. The month is written out completely. This information will benefit the person who receives the letter to respond to the writer if so desired. Place on the left side of the paper about a line or two below the heading. The greeting is meant to “greet" or “salute" the person receiving the letter. You can use the word “Dear" followed by the name of the person to whom you are writing. Or you can just say “Hello." Follow the greeting with a comma. This is the part of the letter when the writer puts the content. It could be thanking a person for a gift or asking how the person is. The writer can include some news about what he or she is doing. It is placed a line or two below the heading and each paragraph is indented. Depending on the relationship between the writer and the receiver of the letter, you can close the letter with words such as “love," “sincerely," “yours truly" or something similar. The closing is like saying goodbye. Place it a line or two below the body and on the right hand side. Line it up with where the heading begins. Placed below the closing, the writer signs his or her name. If you have a magnetic board or felt board, use file cards to write each part of a friendly letter. Pass out the cards to a few students and have each one place the card in the right position for a friendly letter. 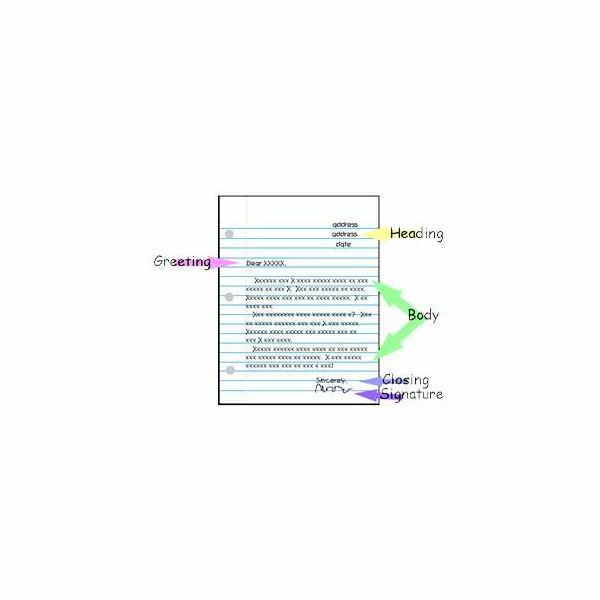 You may also want to provide a blank template of a friendly letter and have the students label the parts. Think of all the people who work in your school: Principal, secretary, cafeteria workers, playground monitor, custodian, former teachers, etc. Write each person’s name on a slip of paper and place the papers in a container. The students will choose a name from the container and write a letter to that person thanking them for the job they do. Use the school address in the heading. After you know how to teach writing a friendly letter to third grade students, it’s important to have follow-up on lessons so that students will appreciate the importance of letter writing and remember the proper format. Think of times when a letter would be appropriate. To thank the room mothers for planning and providing a class party. To thank a guest speaker for visiting the school. To write to a favorite author. When someone is in the hospital.